the clearcoat on my new baby is... gone. in some spots there's a hint of the primer coming through. Has anyone just gone ahead and buffed and hit it with quality clearcoat? I know Don had success with it, but his paint was in better shape to start with. There will not be any budget for a real paintjob anytime soon. I haven't tried it, but I have considered it and I think it's certainly worth a try. It's the old clearcoat that goes bad, not the paint underneath, so I don't see any reason why it shouldn't work. Where you see gray primer..........once the clear is gone the paint will literally wash away. Awesome (cleaner) and a scrubby will wash off the paint. There is not enough to preserve. In my experience doing body work, just adding more clear over top of what you have won't make it go back to normal, it will just make what look you have now shiny. Any new topcoat will give added protection to what is left, but it will still need re color coating to make it look normal again. If you were looking for a first rate paint job, including under hood, inside cab and doors, what would would that cost, exclusive of any body work needed?? I need to have two MJs painted. Any tips about finding the right shop? I've not gone through the process yet myself so other guys can probably do better with specifics, but I can speak to the importance of due diligence. talk to every customer you can find, check the quality of their other work with your own eyes... aka: do your research. It's like everything else on your truck but times a million since it's so visible, expensive and (hopefully) permanent. anyone can pull the trigger on a spray gun, you want the guy/gal that knows what they are doing and takes pride in their work. Pete, if you ever decide to do paint, I had my truck done down there in Marietta. Did great work! As for rates, Manche- All depends on what you want. Scuff and shoot, with no real prep? Cheap. You can save some coin if you disassemble/reassemble yourself- take off trim, tape off bits, etc. But starting condition matters. I paid 2500 for an exterior shoot on mine, with jambs. Did not do the bed(inside) or underhood. But then, it had 0 rust and no major damage needing pulling/filling. Color matters- black needs perfection. White and silver can hide more. On the low end- $8,000 and I doubt you'll find a shop willing to do it that cheap. 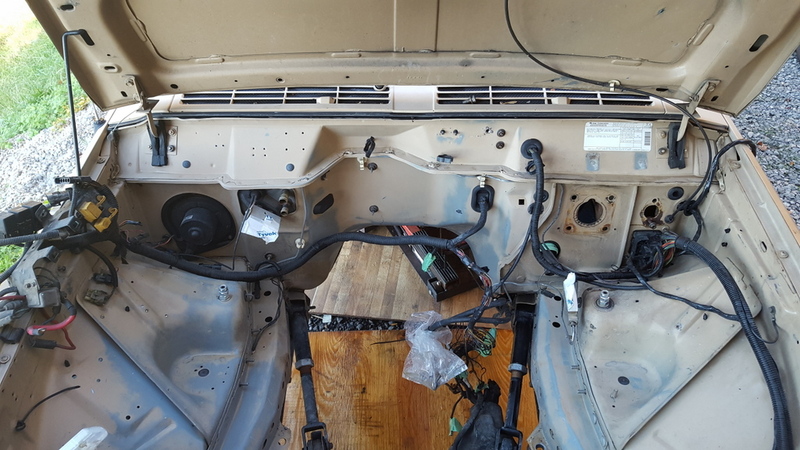 If you are doing jambs and under hood.......doors are coming off and bed is coming off. I'll have at least $1500+++ in materials and countless hours. Prepare to be laughed at or at least snickered. Most shops won't do full paints, those who do, charge, time is money, shop space is time and money. Body work is not exclusive to paint, good shop may not paint over your work. If you want a blow-n-go..........well, you get what you pay for. I'm doing mine myself for several reasons. I found two shops that were willing to do NOTHING more than spray, both wanted $2000 for booth time and nothing else. I would completely strip the truck, do all body work, prime, sand......all prep and have the cab and bed delivered separately and supply all material. This is for a three stage paint, base-pearl-clear. I'm also painting the frame and underside of bed with single stage enamel, stock color no pearl. And black-out with undercoating. No one is going to give me what I want. I stopped asking around because I realized they did not take me seriously, no one pays 8-10K to paint a $2500 truck. Why don't you get some estimates and report back? I got a quote from my cousin, who owns a body shop in Baltimore, for $4000 to paint my 95 YJ. Full job including under the hood, etc. Bottom and inside to be bedlined by me separely. That $4000 included materials and the labor on the base/clear. I would have had to disassemble, do all the prep, primer and sealer and deliver/pickup/reassmble. So Jeep Driver claiming $8000 is probably right on. And way too much for a truck like these. I'm going to learn to paint and put the money towards quality materials and equipment. I've got more than one Jeep which will need paint over the next few years so that plays into my decision as well. I'd like to see some quotes as well.